CTM Deher - View timetables, Compare and book ferry tickets at directferries.ie. CTM Deher operate ferry crossings in the French Antilles connecting the Guadeloupe islands of Basse Terre and Terre-de-Haut in the southern Caribbean Sea. CTM (Compagnie de Transport Maritime) Deher is a family business set up in the seventies by Adolphe Deher with the aim of improving access to Les Saintes for the local population as well as tourists. 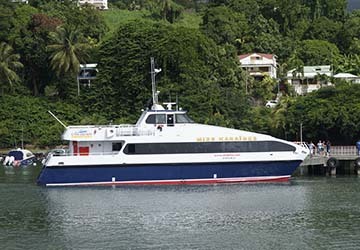 The company operate two high speed ferries on the seven mile trip between the ports in Trois Rivieres and Les Saintes with the journey taking around fifteen minutes and running twice daily, in each direction, with morning and afternoon trips. 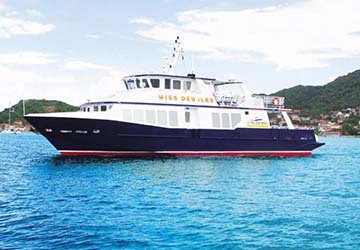 The company's ferries have been specially adapted to serve the islands. Antoinette is around 33 metres in length and can carry up to 200 passengers accommodating 70 in the main lounge and 130 on the sun deck. The ferry is air conditioned and features an on board bar. 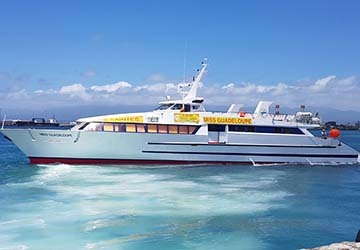 The larger Miss Guadeloupe ferry is around 35 metres long and can carry up to 300 passengers per journey with around 201 housed in the main air conditioned lounge area and a further 99 on the sun deck. A bar service and snacks are offered during the trip. Directferries.ie provides an impartial ferry comparison service allowing you to view numerous ferry company timetables and fares in one quick and easy search. Compare CTM Deher timetables and prices now with all alternative ferry operators before booking your ferry ticket.